The term â€œfine Italian takeout foodâ€? seems like a contradiction. The marriage of homemade pastas, fresh herbs, and decadent sauces is almost the opposite of fast food. HUNGRY? 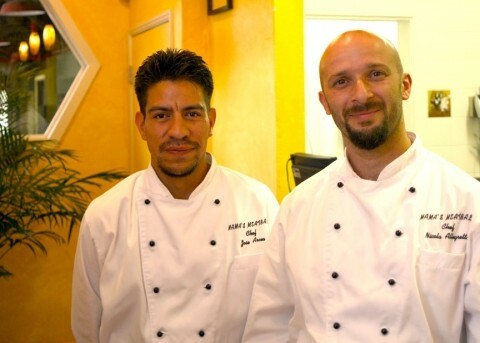 : Chefs Jose Arceo (left) and Nicola Allegretta bring the flavors of Italy to your dining-room table. # Forget about soggy cheeseburgers and stale fries. You can take home rack of lamb or chicken Fiorentino after a stop at the recently opened Mamaâ€™s Meatball in San Luis Obispo. The menu has high intentions and is structured for those not only interested in feeding their hunger, but also in experiencing the intricate flavors of Italy. In the kitchen, working with the intensity of a painter creating a masterpiece, stands Chef Nicola Allegretta. He hails from Molfetta, Italy, a small coastal community on the banks of the Adriatic Sea. There, as a young boy, he worked beside his mother baking bread and making homemade pastas for their family of five. â€œI name this restaurant Mamaâ€™s Meatball, because Iâ€™m always thinking of my mom,â€? Allegretta said. â€œI wish she was here to cook the food sometimes like we all do.â€? At 12 years old, Allegretta went to work at a neighborhood pizza restaurant and discovered his passion for cooking. He honed his skills at the Amedo di Savoia, a culinary school in Bari, Italy. \In opening Mamaâ€™s Meatball, Allegrettaâ€™s goal was to bring hand-crafted Italian delicacies to the homes and soirees of Central Coast residents. Along with Chef Jose Arceoâ€”an immigrant who learned the art of Italian cooking while working as a chef at the Portofino Restaurant in Orange Countyâ€”Allegretta also provides Central Coast restaurants with full-service catering. The chefs create beautifully prepared meals and can also provide the table settings, wait staff, and dÂ»cor that create the desired atmosphere for a special event. Chefs Allegretta and Arceo, who both used to cook at Benvenuti Restaurant in San Luis Obispo, have crafted a widely diverse Italian menu that tempts readers like the smell of fresh-baked bread on a cold morning. Among the superbly crafted dishes is ravioli di zucca, which is homemade ravioli stuffed with pumpkin in an herb butter sauce; rack of lamb, roasted with herbs in a white wine sauce; and cioppino, which is much like you would find in a fine-dinning establishment, complete with salmon, scallops, lobster, clams, mussels, calamari, and shrimp in a savory broth. â€œThis is the best thing to happen here in SLO townâ€”and especially in the Creamery,â€? said Abbey Onikoyi, the owner of neighboring Spirit of Africa. â€œI have eaten here every day since they opened a week ago. My favorites are the Tilapia [sautÂ»ed with white wine, lemon, and roasted pine nuts] and the seafood alfredo.â€? Prices that range from $4 to $22 (with most dinners costing around $10) rank Mamaâ€™s Meatball as one of the best deals to be found in downtown San Luis Obispoâ€”unless you bought property here 20 years ago. Mamaâ€™s Meatball stands just south of Nipomo Street in the Creamery at 570 Higuera. Itâ€™s open for lunch from 10:30 a.m. to 2:30 p.m. and for dinner from 5 to 9:30 p.m. For more info, call 305-0718. Staff writer Karen Velie compiled this weekâ€™s Strokes and Plugs. Send your business news to kvelie@newtimesslo.com.